Please contact us on 07907014112 ask for Oli or Phil. I need some welding on my gates and then painting. How do I contact you? I have been looking for good welding services for two weeks. I need good and professional person who would give me his services with a guarantee of year. Its a good thing that you are providing free estimates. I have a pair of painted steel gates which I want galvanising. The dimensions are approx. 1.0 x 1.5m. I can transport them to you. Please can you quote me a price? My phone no. is 01248-600532; e-mail peterjcoleman@btinternet.com. 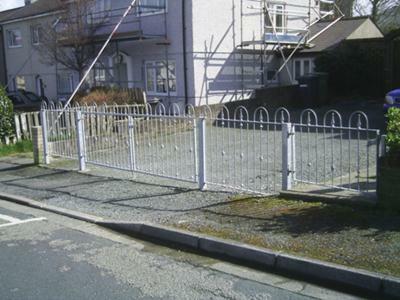 The services offered by the Anglesey Welding Service are superb. The image of the galvanized gate posted on the page seems great. I would like to know of you people offer any guarantee for your services. Please reply soon. please visit our new website [.................] for folding dinghy launching trolleys, boat trailers, keel rollers and rubbers, winches, jockey wheels, trailer spares, used boat trailers. mobile welding on anglesey and north wales for cars, mot failures, marine welding. Phil its a decent web page but I feel you could improve it by adding far more examples of your past work....work as diversive as possible. I am assuming you have a portfolio??? if not it may well work in your favour if you develop one so you can not only include stuff here but also show prospective clients.......( if it was me I would be very tempted to photograph work within my capabilities and maybe say they were examples of my work) ...oops!...take care mate see ya soon ,Robby .